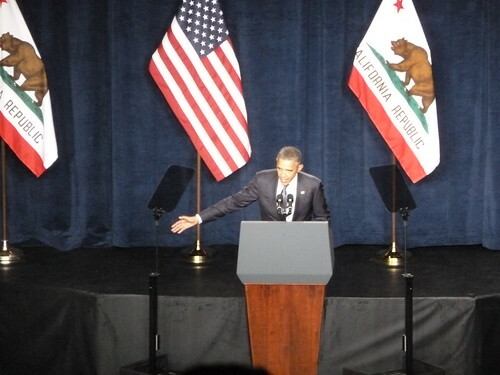 The Resident Expert and the Mellowcat had the good fortune to hear the President speak last night in our home town. 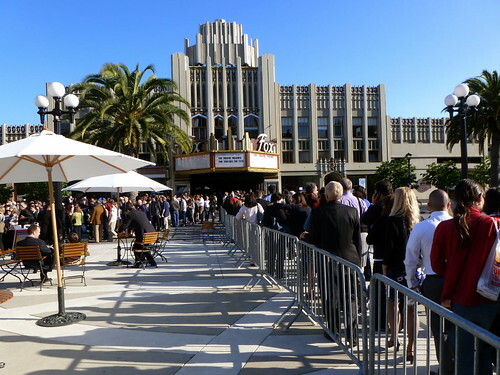 We left work early, in order to get ourselves assembled to be admitted to Redwood City’s Courthouse Square at 4:30. 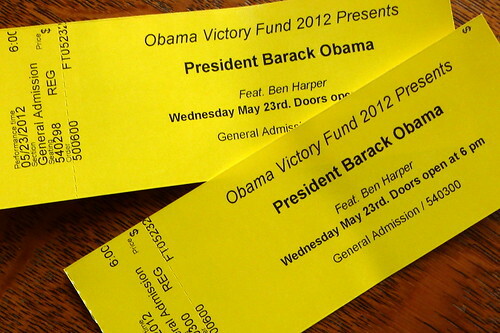 The event was scheduled to start at 6pm, but we figured it would likely be a while before the President took the stage. 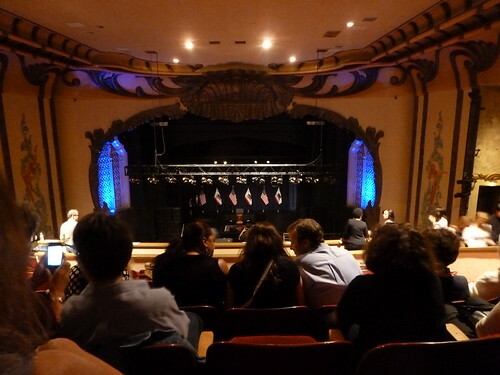 The Fox Theater staff had a nice setup for us all to gather and chat while we waited for the venue to open. I overheard the fellow next to me in line recalling seeing Robert F. Kennedy, and I mentioned to him that I had seen JFK when I was very young, and didn’t remember much of that day. He said he hadn’t either, but the memory he did have was imprinted because RFK was assassinated the next day. Turns out he was also from Buffalo, NY, so we had that to discuss as well. And he’s the brother-in-law of one of the owners of the Fox Theater. I wasn’t able to parlay our chance conversation into VIP seats, unfortunately. By 6:30 pm, we were through security and in our seats. I’m not sure it made too much difference getting there so early; most of the general admission seating was way in the back or along the sides, but we did get seats in the center of a row and our view of the stage was pretty good. We both expected there would be a long line of Edward Everett-style speakers in advance of President Obama, but nothing happened on stage for quite a while. The gathering crowd was in very good spirits, and stayed that way all evening. We chatted with the couple seated next to us; I had seen the guy at the car wash last weekend with his son. The only reason I recognized him was that his son, just a toddler, was basically a scale model of his dad. They even had similar haircuts. It was busy at the car wash, so I had plenty of time to study them. They were an interesting couple, which helped pass the time. Somebody said they heard that Air Force One hadn’t yet touched down at Moffett Field, so it could be a while. 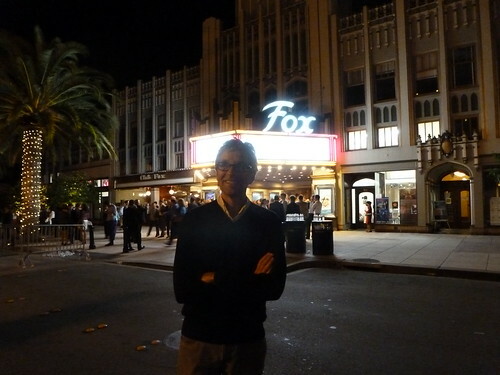 Around 8:30 or so, the owners of the Fox Theater came out to introduce Ben Harper. This couple has really done a lot for the city by taking on the Fox Theater. They handled their remarks very well, considering the once-in-a-lifetime moment that this was. 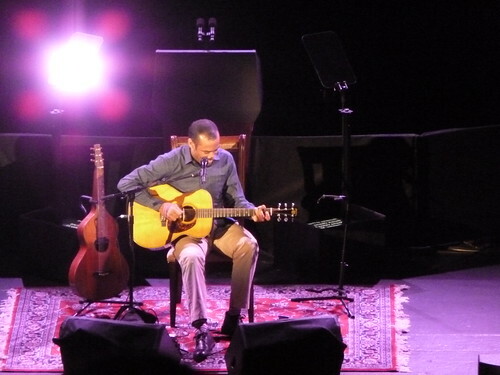 Then Ben Harper came out to play a few songs. I knew nothing about him before yesterday, but will now have to check out his music in more depth. He’s a funny and engaging guy, along with being a skilled and versatile musician. Now it’s getting pretty late, and people are anxious to see the President. But the next person to speak is Redwood City mayor Alicia Aguirre. Clearly a bit nervous, she lost her place in her text a couple of times. But she did work in a few good Redwood City-boosting phrases, which the mayor and city council certainly earned the opportunity to express. If they hadn’t launched the downtown project years ago, last night would not have happened. Not everybody in the crowd was from Redwood City, so her reference to “climate best by government test” prompted the person behind me to ask, “What?”. After her speech, a large movie screen was lowered across the stage, and we were shown “The Road We’ve Traveled” . And not long after that, the PA announcer said, “Ladies and gentlemen, the President of the United States”. The President made a strong case for the accomplishments of his first term, and the importance of continuing the work that he and his administration have started. I don’t know about the other people at this event, but for me a strong attraction was just to see this man in person and express gratitude that he is our president now; we’re so lucky that he came along at this point in our history. But the more he talked, the more this moment was less about what happened in 2008, and much more about what is at stake in 2012 and beyond. He made as strong a statement for why he should be re-elected as I’ve heard from him up to now. More of this, and we should be OK. But I need to figure out some way to participate in this thing. While were waiting in the theater, three fully-outfitted police or maybe Secret Service men came up the aisle and went into the theater’s old movie projection booth, which was right behind us. They had rifles and everything. I thought it was bit odd that they entered through the theater, and weren’t in position well in advance, but it could be that this route is the only way to that position, and that they were traveling with the President, who probably had arrived outside the theater about that time. During the long wait before things started happening, someone started yelling “Fired up!” and the crowd immediately responded with “Ready to go!” This went on for more than a few call and response exchanges, and I was beginning to wonder if the “fired up” person’s voice would hold up for much longer. She definitely had the volume, but not the sort of voice and delivery that seemed capable of sustained expression at this level. Much more of the sort of voice you might expect to hear when someone yells, “the toaster is on fire!”. Another thing that happened during the long wait; a couple seated in front of us got up to hit the bar or just walk around, and the woman fell down the steps in our upper balcony. Went down pretty hard, from the sound of it. The EMT guys were right there, and they eventually had her connected to an IV and she was carried out on a stretcher. I don’t know if she fainted or tripped on the carpeted steps. Those steps are a bit tricky; they are designed with alternating depths for the tread. I noticed more than one person stumble on those during the long period of milling about during the evening. I hope she’s OK. A tough thing to have happen; no doubt they were both as excited as anyone to have the opportunity to see and hear President Obama.